If there’s one thing you should know about steaks, it’s that the best ones are dry-aged. Dry-aging is an age-old process (no pun intended) by which large cuts of beef are aged from a span of weeks to months before being cut into steaks. Although the process takes long, dry aging is definitely worth the wait. They are the most tender and flavorful because water is evaporated from the meat, concentrating the flavors and breaking down the collagen, leaving nothing but the best possible beef. Because the process requires a lot of space and precise conditions of temperature and humidity to be met, only fancy steakhouses serve dry-aged steaks. Luckily, you don’t have to fly all the way to New York to taste good steak. 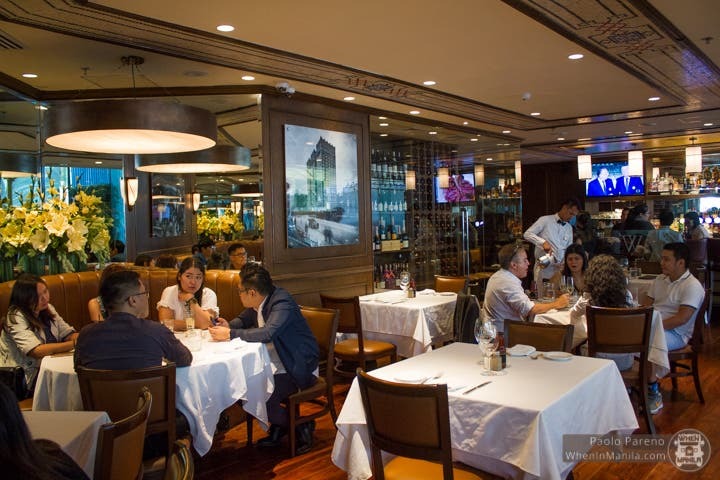 Wolfgang’s Steakhouse, rated as one of the best in New York, currently has two locations in the metro, one at Resorts World Manila, and one at The Podium, Ortigas. Later this year, a third location will open in BGC. Park Avenue New York, as it turns out, is just a drive away. We recently had lunch at Wolfgang’s Steakhouse’s location at The Podium. Per manager’s recommendation, we tried The Wolfgang Experience, a three-course meal that comes with soup or salad, one entrée, and the dessert of the day. Of course, if you go to a steakhouse that serves critically-acclaimed dry-aged steaks, then it only makes sense that that is what you order. So, for our entrée, we requested for a medium-rare 600 gram dry-aged rib eye steak. The steak was served without any sauce. No fancy nonsense, just a good old-fashioned, massive bone-in cut. Just how steak should be! Rib eye is my personal favorite cut, and Wolfgang’s Steakhouse served it exactly the way you’d want it. You could tell by looking at the steak that it was seared exquisitely, with the top and bottom caramelized dark brown. The meat was so tender that slicing the steak was like slicing a piece of cake. The center was pink with a hint of red. This was a medium rare steak prepared perfectly. The moment of truth was taking the first bite. As expected, it was heavenly. The buttery flavor from the fat marbling made my mouth water. The steak was so easy to chew, that it felt like it could melt in the mouth. Especially when paired with a glass of red wine, Wolfgang’s Steakhouse steak is a feast for the palate. Wolfgang’s Steakhouse is the place to be if you’re a bona fide steak lover, but they also serve delicious non-steak items as well. The food may be quite pricey, but dining here, you’re guaranteed a true gastronomic delight.